I just plain give up for Lent. Comments Off on 40 days of what…? It’s here! How you holding up so far? Pacing thyself is key during Mardi Gras. So are comfy shoes and a decent place to pee. Remember to drink water and force yourself to snack often. Stay with the group and never ever pick beads up off the ground and then put them around your neck. That’s just yucky. Make sure you catch The Bayou Krewe riding in THOR Weds 2/18! Gonzo, Jeanne, Lil Kenny and the all new BAYOU BABES of 09! And the Bayou Krewe VIP on the Miller Lite Balcony at the Royol Sonesta on Bourbon St Monday afternoon on Lundi Gras! Always a great time! And this year, who knows WHAT celebs will show up??!!! Be safe during mardi Gras workforce and please, don’t show em if they’re gross……you know who you are! Today I left my house and got pooped on by a bird. I then got in my car to drive to work and ran over what I thought was a small child. Thankfully it was a stuffed animal toy. This caused me to swerve into someone’s front lawn and get stuck in the mud. The owner of the house happened to be in his driveway and helped push my car to safety. I apologized profusely and he said “No worries baby, this is New Orleans, mud happens…” I smiled at that and got to work in a good mood. Until I entered our front lobby and saw all the Valentine deliveries waiting to be picked up by their recipiants. Balloons, chocolate, teddy bears, gift boxes, soaps, Flowers, etc. For a split second I thought MAYBE just maybe one was for me. No chance. For another split second I felt sorry for myself. Only for a second. Then I realized all these couplelards and co-workers will feel bad for me and GIVE me some of the chocolate! It worked! And they did. So, I ended up getting some chocolate anyways. And my dad sent me a card with a check in it. Now I can buy my own chocolate. And I’m not sharing. Angelina Jolie and Octo-Mom. Coinicedance? I think not……..
Not a bad show this year! Whitney Houston took a nap while presenting an award, Paul McCartney rocked it with Dave Grohl all the while the dye from his hair was streaking, The Jonas Brother’s hit puberty and ColdPlay dressed like the Beatles from Sgt Peppers…if the Beatles were the Wiggles. All and all a good time! Robert Plant was the big winner with his collaboration with Alison Kraus. Is it just me, or does Robert and the Quaker Oats guy look alike lately??? My girlie insides hurt everytime I think about this woman. She had 8 babies all at once. Octuplets. I call her ‘Octo-Mom’. She also already has 6 kids under the age of 7! That’s……a lot of babies! Look at her picture. She looks healthy and pretty good for just popping out 8 babies. But look a little closer into her eyes. She got a little crazy goin on back there don’t ya think?? Another woman in Canada gave birth to twins last week. She was 60 years old! SIXTY! Ya, use caution on date night. Seems to be extra fertilitizing going on in the world! Pot! What’s it good for? Absolutely nuthin…..But people seem to smoke it tons. And perhaps it may become legal someday. That’s for another blog. This one is for Olympic Swimmer Michael Phelps. Caught smoking a bong. SO WHAT I say! He does need 35 thousand calories a day. The pot probably helps that. And there’s water in the bong. Isn’t that some kind of connection to his swimming after all? Authorities want to press charges on him. Isn’t winning 8 gold medals enough to be able to have a little smokey smokey? He wasn’t shootin’ steroids fercheesesake! Who took that picture and leaked it to the press? That person should have charges brought against them. Fight the charge Michael! And keep up those munchies! Comments Off on Pot! What’s it good for? And thanx for making my wallet a little fatter today! Although many of us in New Orleans were not emotionally attached to the Superbowl, it was one of the BEST Superbowl games in the History of the pigskin!! I honestly didn’t mean to drink 4 bottles of champagne by myself on Superbowl Sunday. Not to mention the 2 bloody Marys and 1 mimosa at brunch earlier in the day. Something about the big game combined with great food ( a whole pig was roasted) and good friends makes you enjoy yourself too much. In the beginning of the game, I thought it was sorta boring and lame. Neither team seemed to remember how to play defense. Thus me not paying attention too much and continueing to refill my champagne. Then, all of a sudden, BOOM! Great game! (and great buzz…) big Ben deserves his accolades. And hey, The Cards weren’t too shabby either! The TV commercials were not ‘ blow me away’ great this year. Did you notice that too? But some of them made us chuckle. 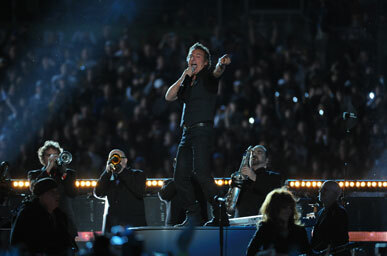 And how much did Bruce Springsteen and the E-Street Band rock halftime???!!!! One of the greatest half time performances ever! It’s gonna be hard to top that one next year. Maybe Bruce should just play EVERY Superbowl from here on out. The pre-game performces by Journey, Faith Hill and Jennifer Hudson were chilling to say the least. Journey because I thought the new lead singers eyes were gonna pop outta his face. Kinda creepy yet rockin at the same time. And Jennifer Hudson sang a beautiful Natl Anthem. (she’s had tragedy remember with the murders of her mother and relative recently) And my petition to have EVERY Superbowl in New Olreans is coming! Looks like maybe we’ll get it in 2012 or 2013. By then, hopefully they’ll be enough bathrooms in the Superdome to accomodate. After the Big Game I beleive is when the New Year REALLY starts. Now is the time to concentrate on getting heathly. And building up our liquid tolerance for Mardi Gras! Comments Off on Hello Pittsburgh!